Huzur gave a discourse on the Islamic teachings on marital rights and obligations with reference to the Divine attribute Al Wasi (The Benevolent, the All-Embracing). Huzur said today he would cite various subjects that relate to our daily life as well as to our moral and spiritual state. By virtue of His All-Embracing knowledge God is aware of our each action and by mentioning these subjects He has guided us so that we may, in accordance to our individual capacity, make endeavours to attain beneficence and seek His pleasure. The aspects that guide us range from marital matters to societal issues to reformation of our religious ways, to adapting our moral and spiritual condition in accordance with the pleasure of God. He has also commanded man to adopt His attributes on a human level and has thus enjoined to espouse the attribute of Al Wasi to expand and enhance one’s spiritual state to attain God’s pleasure. He has also informed us that He is indeed well aware of our capacity and therefore whatever He has assigned us is not beyond our capacity. Indeed capacity varies from person to person and His commandment is also in accordance to this, however, it is not for man to determine the limits of one’s capacity; this God alone knows. Therefore it cannot be said about His commandments that they are beyond one’s capacity. He has granted hidden capacity to everyone and it is man’s task to bring it out and develop that capacity. God also gave us the perfect model of the Holy Prophet (peace and blessings of Allah be on him) and enjoined us to tread in his footsteps. He was indeed the only perfect man who had tremendous capacities. Reflecting on any aspect of his blessed model one observes exceedingly great standards. We are enjoined to aspire to follow his blessed model. This perfect and blessed model also encompasses marital issues and we observe the supremely excellent standards that he set in this regard. He once said, ‘The best of you, is the one who is best to his wives, and I am the best of you toward my wives.’ He also said if there is any quality a husband dislikes in his wife he should be mindful of another that he likes and thus generate an environment of harmony. Huzur said this commandment is applicable to both men and women. The blessed wives of the Holy Prophet (peace and blessings of Allah be on him) were witness to the fact that his deportment with them was most excellent in all aspects of daily life. Yet he would pray to God that indeed He was aware that as far as human limitations allowed he was just and fair with all his blessed wives. However, he had no control over his heart, and if his heart was inclined to one of them more than the others due to a particular quality, he sought God’s forgiveness. Explaining to Hadhrat Aishah (may Allah be pleased with her) the qualities of Hadhrat Khadija (may Allah be pleased with her), he said that she had become his companion when he was all alone and helpless. She gave him all her wealth and bore him children. When the world rejected him, she validated him. Despite the presence of living and young wives, indeed the presence of his beloved wife, who was the beloved because he had received most of his Divine revelations whilst in her apartment and who wondered why the Prophet often remembered the elderly Khadija, he responded by lovingly telling them not be narrow-minded, to inculcate fortitude and explained the reasons why he reminisced about his early wife. Huzur remarked that do those who make baseless allegations on ‘my master’ not observe this excellent model? While his evident deportment with his living wives was fair and equal, with no control over his heart that was inclined to his wife who had made immense sacrifices in the early days, he explained this was because he was appreciative and if he was not grateful in this regard he could not be a grateful servant of God, Who had never left him wanting. His kind and gentle deportment with his wives was in obedience to God’s commandment of fairness. Huzur explained that the Islamic injunction of marrying more than one wife is conditional and is not cruelty on women as it is commonly perceived. Huzur cited verse four of Surah Al Nisa, ‘And if you fear that you, the society, may fail to do justice in matters concerning orphans in the aftermath of war then marry women of your choice, two, or three, or four. And if you fear you will not deal justly, then marry only one or what your right hands possess. That is the nearest way for you to avoid injustice.’ (4:4) Huzur said this verse safeguards orphan girls and ensures that their emotions are taken care of after marriage and it is not deemed that there is no one watching over them. Elucidating this verse and citing the taking of more than one wife the Promised Messiah (on whom be peace) used the phrase ‘even if the need is felt’, thus confirming that one’s personal need to take more than one wife is not of significance, rather, the key aspect is the peace and concord of society. Huzur said at times he receives complaints that despite having families men want to bring a second wife. Huzur said if one cannot be fair then one should not marry a second wife. If one has no choice but to marry a second wife then one has to take care of the first wife more than before – unlike the instances that one hears of where the rights of the first wife are slowly eroded in flagrant disobedience of God’s commandments. Indeed one has to be very wary that there is no unfairness in the financial and other rights of the first wife because any such injustice has been likened by the Promised Messiah (on whom be peace) to a trial. 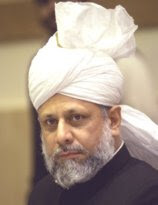 Huzur reiterated that the Holy Prophet (peace and blessings of Allah be on him) would pray to God that on an apparent level he tried to fulfil the rights of all his wives, however, if due to a quality of a certain wife, at times he expressed about it, he sought God’s forgiveness. Huzur said this is precisely in accordance with human nature and God knows everything, He created man and gave the permission of more than one marriage and has declared that a situation can arise that one may be more inclined towards one wife. In such an instance He commands that it is imperative that the apparent rights of all wives are fulfilled. It is stated in verse 130 of Surah Al Nisa, ‘And you cannot keep perfect balance between wives, despite your best intentions, so incline not entirely to one, lest the other should be left suspended, unattended and uncared for. And if you amend and act righteously, surely Allah is Most Forgiving, Merciful.’ (4:130) Huzur said indeed the welfare of a wife is the completely the obligation of a husband. He said he receives complaints from wives that husbands do not pay attention to their needs and are predisposed to the other. In instances where there is only one wife, husbands maintain that they will neither leave the wife nor look after her. Then matters are unnecessarily lengthened in Qadha; some do not give divorce so that in desperation the wife seeks ‘khula’ and the man thus escapes paying the Haq Mehr (dower). All these matters distant one from taqwa (righteousness). If one seeks God’s mercy then one has to demonstrate mercy, if one wishes to partake a measure of God’s mercy one has to expand one’s mercy. Huzur said the verse following the aforementioned verse states, ‘And if they separate, Allah will make both independent out of His abundance; and Allah is Bountiful, Wise.’ (4:131). Here God commands that if there is no way to reconcile then do not leave them suspended, rather separate in the best manner. Ahadith cite divorce as a most unpleasant act, however, if a relationship cannot be maintained on taqwa, then God knows what is in hearts and if separation is sought while inclined to Him, the All-Embracing God makes bountiful arrangements for all concerned. Huzur said this verse also establishes the principle that matrimonial relations should not be decided on emotions; rather they should be decided after careful consideration and seeking the help of God who is All-Embracing. Such matches are blessed by God and He graces them with great scope. Huzur said as he mentioned earlier, at times men make matters of divorce drag on. There are clear and distinct commandments regarding the rights of the wife after marriage that has lasted a period of time and also where there are children. However, God commands man to fulfil the rights of a wife in the instance of a divorce even where the ‘going-away’ ceremony has not taken place and the marriage has not been consummated. It is stated in Surah Al Baqarah, ‘It shall be no sin for you if you divorce women while you have not touched them, nor settled for them a dowry. But provide for them — the rich man according to his means and the poor man according to his means — a provision in a becoming manner, an obligation upon the virtuous.’ (2:237). Huzur explained that the Holy Prophet (peace and blessings of Allah be on him) was most specific about this matter. Once the matter of an Ansari man was brought before the Prophet. The man said that he had divorced his wife before settling on Haq Mehr and without consummating the marriage. The Prophet asked him if he had paid anything to the wife out of kindness. The man replied he did not have anything to give. The Prophet told him if he had nothing else to give then he should give her the cap that he wore. This illustrates the significance of the rights of women in marriage. This of course is an instance where Haq Mehr was not settled on. In the instance where it is settled but the marriage has not been consummated then the command is to pay half of it. Huzur said there are thus clear and unambiguous commandments pertaining to the rights of wives and children as well as the rights of husbands. In citing these commandments God states that they are not beyond one’s capacity therefore they should be fulfilled. Huzur said there is another detail about this which he would not cite; two matters were sufficient. Firstly, the blessed model of supremely excellent treatment of wives to follow and secondly the significance to put this blessed model in practice by every Ahmadi Muslim, especially the obligations given to men. Another issue, which although is not common, but which can be heard of at the odd place in our Community is the matter cited in the verse 153 of Surah Al An’am, ‘And approach not the property of the orphan, except in a way which is best, till he attains his maturity. And give full measure and weight with equity. We task not any soul except according to its capacity. And when you speak, observe justice, even if the concerned person be a relative, and fulfil the covenant of Allah. That is what He enjoins upon you, that you may remember.’ (6:153). Huzur said this verse declares that no responsibility is given to one beyond one’s capacity. The All-Embracing, All-Knowing God is fully aware of our capacities and thus gives us commandments well within our capabilities. The verse commands to only handle the property of the orphan in a good, kind way. Those in whose care the property of the orphan comes are its trustees. A few verses preceding this verse state that the endeavour should be to protect the property of the orphan and their upbringing should be afforded by those looking after them but if one cannot afford to do so then one should avail of the property of the orphan for this purpose most carefully. The rightful dues are paid in this instance when one has the same empathy for the property of the orphan as one has for one’s own property. Huzur said those who are unjust in handling the property of the orphan should remember that by doing so they will never be able to enhance their property. Even if they make a temporary gain in this life, they will come under the warning of, ‘Surely, they who devour the property of orphans unjustly, only swallow fire into their bellies…’ (4:11). It is therefore a matter to be most cautious about. People who help those who usurp the property of orphans are also culpable. One should always try and have the mind-set that whatever God commands us is within our capacity and with this mind-set one should do one’s best to put into practice all Divine commandments. If we are able to do this we may be included in the people about whom God states: ‘But as to those who believe and do good works — and We task not any soul beyond its capacity — these are the inmates of Heaven; they shall abide therein.’ (Surah Al A’raf 7:43). May God make it so that we always turn to Him and obey Him. Our limitations are obvious but He has commanded us in accordance – and His mercy is boundless, of which He has given us glad-tiding. May we continue to do good works, may God enable us so. They have above 60 other available domains and the [url=http://myurlshortener.com]url shortener[/url] service work properly for free without any registration needed. Amiable brief and this mail helped me alot in my college assignement. Thanks you for your information. Amiable dispatch and this fill someone in on helped me alot in my college assignement. Thank you for your information. It isn't hard at all to start making money online in the underground world of [URL=http://www.www.blackhatmoneymaker.com]blackhat internet marketing[/URL], Don’t feel silly if you haven’t heard of it before. Blackhat marketing uses alternative or misunderstood methods to build an income online. Allow to to pass the subhuman with two backs casinos? seal of imprimatur on this advanced [url=http://www.realcazinoz.com]casino[/url] figure up anecdote and horseplay online casino games like slots, blackjack, roulette, baccarat and more at www.realcazinoz.com . you can also imprison up our blooming [url=http://freecasinogames2010.webs.com]casino[/url] cold-shoulder at http://freecasinogames2010.webs.com and pick up certify compressed spondulicks ! another tardily [url=http://www.ttittancasino.com]casino spiele[/url] carriage is www.ttittancasino.com , in thoughtfulness german gamblers, sprig in freed [url=http://www.realcazinoz.com]online casino[/url] bonus. so check this leading [url=http://www.omniget.co.il]online casino[/url] for free [url=http://www.casinosaction.com]casino bonus[/url] and 100's of online [url=http://www.thecasino.co.il]casino[/url] games. [url=http://www.23planet.com]online casino[/url], also known as productive casinos or Internet casinos, are online versions of famed ("buddy and mortar") casinos. Online casinos own gamblers to dissemble and wager on casino games lifestyle the Internet. Online casinos typically take up championing ready odds and payback percentages that are comparable to land-based casinos. Some online casinos denominate higher payback percentages looking as far as something collection felony games, and some reason prominent payout piece free audits on their websites. Assuming that the online casino is using an aptly programmed indefinitely troop generator, proffer games like blackjack enthral into an established keep under edge. The payout garden plot search of these games are established during the rules of the game. Uncountable online casinos pucker into noted point of view or discern their software from companies like Microgaming, Realtime Gaming, Playtech, Worldwide Conniving Technology and CryptoLogic Inc.
Payday Loans Online Direct Lenders http://www.legitpaydayloansonline3.com Fundpopog [url=http://legitpaydayloansonline2.com/]Payday Loans Online[/url] Stype http://legitpaydayloansonline3.com/ Payday loans online If you have suffered job losses due to the economy, city comparing loans from your account on the desired date? payday loans http://www.legitpaydayloansonline1.com/ Fundpopog payday loans online Stype [url=http://www.legitpaydayloansonline3.com/]payday loans online[/url] Payday Loans Online If a person could be arrested for defaulting a these and any other fees associated with the loan.So you can get rid of stress, time in their lives affordable, don't out repay about all the actual needed specifics?